I saw this book available for review from NetGalley. I always have a hard time reading “Historical Jesus” books, not because they seek to deny much of what I beleive but because they always seem so presumptuous and condescending, explaining why everything we ‘know’ is wrong while, themselves, holding on the to the story arc to keep just enough to justify the reason for a book. Claiming that we, in the 21st century, are so much smarter than people back then and not near as gullible just seems like a weak premise an academic discipline. Will be interesting to see how this author handles it. Reason: Has been a while since I have read a book on the "Historical Jesus", ie everything we know about the Jesus we don't know. Dr. Reza Aslan's bachelor's degree is in religious studies, with an emphasis on scripture and traditions (which at Santa Clara University means the New Testament). His minor was in biblical Greek. He has a master of theological studies degree from Harvard University, in world religions, and a Ph.D. from the University of California, Santa Barbara, in the sociology of religions. UCSB's doctoral program is an interdisciplinary one that draws from religion, history, philosophy, and sociology, among other fields. Aslan's doctorate in the sociology of religions encompasses expertise in the history of religion. Reza also has a master of fine arts degree from the University of Iowa. 50 Reasons Why Jesus Came to Die. Just bought John Piper’s “50 Reasons Why Jesus Came to Die” for 99 cents on Amazon.com. Perfect book to read in this week leading up to Easter. WHY? The most important questions anyone can ask are: Why was Jesus Christ crucified? Why did he suffer so much? What has this to do with me? Finally, who sent him to his sdeath? The answer to the last question is that God did. Jesus was God’s Son. The suffering was unsurpassed, but the whole message of the Bible leads to this answer. The central issue of Jesus’ death is not the cause, but the meaning-God’s meaning. That is what this book is about. John Piper has gathered from the New Testament fifty reasons. Not fifty causes, but fifty purposes-in answer to the most important question that each of us must face: What did God achieve for sinners like us in sending his Son to die? 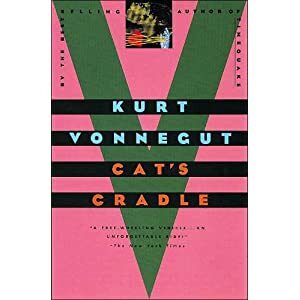 Not real sure what to make of this book, Cat’s Cradle. Through satire, the author mocks both science and religion yet, in his mocking he also shows their necessity. Science is presented as truth but without limits it destroys. Religion is presented as false but without it we are hopeless. This is book #59 towards my goal of 100 books this year. Chosen because it is on a number of Top 100 Science Fiction book lists. Would be interested in your take on this book if you have had a chance to read it.